Pozole, also spelled posole, is a stew made from hominy, or nixtamal, which is dried corn. The dried corn itself may also be called pozole or posole rather than hominy. Cooked, canned hominy is also available, but for this stew you’ll want to start with the dried kind. When our weather finally changed, the dark, rainy sky made it seem like time for a slow-simmered stew. I stole ideas from two different recipes, and just to complicate matters, I changed a thing or two. First, I had read Deborah Madison’s pozole recipe in Vegetarian Cooking for Everone which starts with soaked pozole simmered in water with a few dried guajillo chiles, some smashed cloves of garlic, chopped white onion, and dried Mexican oregano. I also looked at Rick Bayless’ recipe in Mexico One Plate at a Time which is a pork and hominy stew. I wanted to skip the pork entirely, but I was interested in the addition of some stock once the corn is cooked to a tender state. 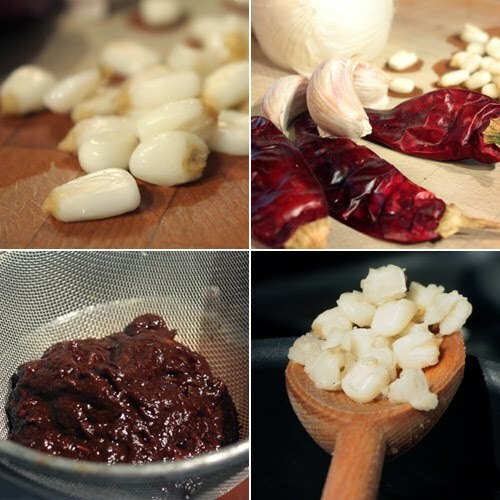 Also, in that recipe, some ancho chiles are rehydrated and then pureed. That puree is strained into the stew when the stock is added. After picking and choosing and changing this and that, I ended up with a mix and match pozole rojo. Stick with me on this, most of the time involved is spent reading a book while the stew simmers, and the result is worth every minute. The day before I started cooking the stew, I poured boiling water over the dried pozole and left it to soak until the next day. From reading the information in Mexico One Plate at a Time, I understood that the longer the pozole could cook the better. Bayless points out that it’s often left to simmer overnight before fiestas. I drained the soaked pozole and began cooking it in fresh water about five and a half hours before I planned to serve it, and I would guess that three hours would be the minimum cooking time. The goal is to cook the corn to the point at which it flowers, or the kernels begin to open somewhat resembling popcorn. I added the chiles, garlic, onion, and oregano as suggested in Deborah Madison’s recipe. After three and a half hours of cooking, I added a couple teaspoons of salt. An hour later, I added some chicken stock and pushed the pureed ancho chiles through a strainer into the stew. That was left to simmer for one more hour. During that last hour or so, you should taste the stew a few times and consider adjusting the seasoning. I ended up adding almost two tablespoons of salt before the corn and broth were well seasoned. Bayless explains that the corn absorbs a lot of seasoning, and extra salt is usually needed. Last, but certainly not least, are the toppings. Pozole is presented with any combination of the following: thinly sliced cabbage, thinly sliced radishes, dried Mexican oregano, tostadas, sliced jalapenos, cubed avocado, lime wedges, cilantro leaves, diced onion, crumbled queso fresco, and sliced meat such as the grilled chicken that I served. A warm bowl of tender, cooked corn with a fragrant, deep red broth is topped with whichever of those items you choose. And, it happens to be delicious served with crunchy tortilla chips and the roasted salsa verde from Mexico One Plate at a Time . I'm sending this to the Mexican Fiest at aromas y sabores. A very tasty corn chicken soup that you have prepared....I think both tortilla chips or thin garlic bread would be very good to go with the soup. A flavorful dish! I love that kind of food! I adore posole and haven't made it in so long. This looks like a wonderful recipe. I've almost always had pazole with the meat (usually pork) cooked in the stew. I love the idea of offering it as a garnish. I haven't ever made it with rehydrated corn so I'll have to try that technique. It looks just lovely! Mmmm...That looks really delicious. I don't think I've had dried corn, yet. That's really interesting. I got to give this a try and it's the perfect season to do so. Oh my goodness Lisa, this sounds so gooood! My husband will love this so much. Sometimes, making Mexican food really discourage me because of the long process. But, this one is probably pretty manageable to me. Thanks for sharing! mmm…brothy! my grandpa makes hominy for our family, and it's something i always appreciate--it definitely has a unique flavor! although i don't enjoy it plain, i love it in posole--gorgeous creation, lisa! This dish sounds amazing and so healthy. I've never heard of pozole before but have read the link you posted. This looks excellent! I've only had this once and it didn't look nearly as good as yours. I'd love to cozy up to a bowl of this on a chilly fall night. All this time the word pozole brought forth a completely different image. Funny. No matter, it still looks tasty. I've never tried this before! Neither have I tried hominy...I'm really missing out! I wish I had a big bowl of this a couple days ago when we had a freaky thunderstorm here, which is very strange for this time of year in the Bay Area. 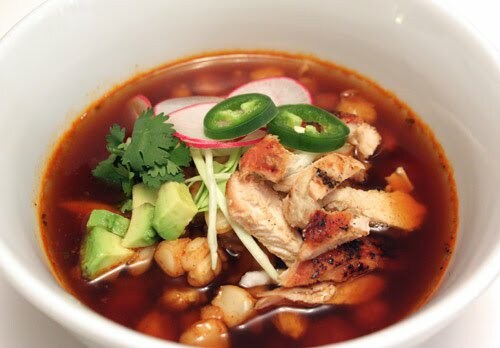 A nice comforting bowl of spicy, aromatic pozole would have warmed me up nicely. Wow, looks fantastic!! Comfort food! This looks amazing, fantastic photos! great comforting stew with all kinds of tantalizing flavors going on here. I love spicy foods! I grew up eating this around New Year's, it is quite the treat. I usually prefer pozole over menudo. This looks deliciou! This is a really terrific dish as it is both comforting with the broth & chicken and refreshing with the avocado & radishes on top. Excellent! 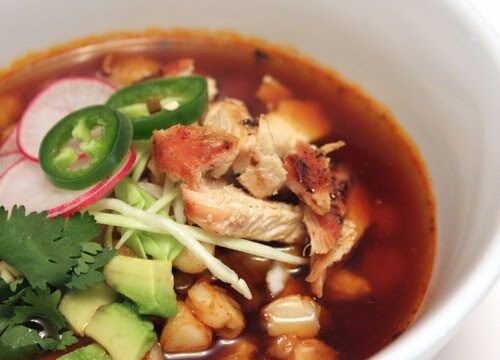 I've never heard of pozole before, but it looks so flavorful and comforting! I'm always learning new thing on your blog! The broth looks so clear yet so flavourful! A great dish to warm you up! what a gorgeous corn chicken soup! Surely extremely delicious! Lisa, thanks for the link!!! If you answered homini that's it! I'd probably comeback and ask you what is homini, ha...ha...ha... glad that you explained it! Will definitely making this. I'll let you know about it asap! Looking forward to making this comforting soup this fall! Posole is definitely one of my favorite dishes. We tend to make it a bit thicker -- more like a stew, but I bet it's just as good this way. I like how you melded two of my favorite recipes. Gorgeous stuff! que rico! Pozole is one of my favorite traditional Mexican dishes. Being from Louisiana, I love spicy food. I cant wait to try this out. I love posole and your tweaking looks amazing. I have the cookbook from Rick Bayless and it is a much love addition to my collection. Have never had a bad recipe. Looks good, I just made this a few days ago.